My husband LOVES tacos. Whether it Instant Pot whole chicken or slow cooker carnitas, homemade flour tortillas or homemade corn tortillas – he doesn’t care. Wrap it up and call it dinner! Thanks to cilantro lime coleslaw though, that’s not happening anytime soon! You see, when I first launched my signature course Grocery Budget Bootcamp, I was pretty much glued to the computer for the entire week. Between answering questions and making sure everything was working, I was incredibly busy! But I had planned ahead and talked to the husband… would it be okay if I made a big batch of slow cooker carnitas at the start of the week and we just eat leftovers each night? He – and BOTH KIDS – pumped fists in the air as they excitedly said yes! The first couple nights were fine… the awesomeness of tacos hadn’t worn off. But by day 3, even I was getting tired of the same thing. That’s where cilantro lime coleslaw comes into play. After having these a few times, we added cilantro lime coleslaw to the mix – along with coconut rice and homemade Frank’s hot sauce – and we call these tacos Baja style. The recipe for cilantro lime coleslaw is incredibly basic, and incredibly flexible. I used mostly green cabbage, with a little bit of red cabbage just for color. Honestly, pick whatever cabbage works for your budget and/or is on sale. Napa cabbage is SO good, and great for those who typically don’t like cabbage in general. Bok choy is also in the cabbage family. I haven’t tried it in this recipe, but if you like bok choy, I’m sure you won’t go wrong. You can see that I added julienne carrots to my version, partly for color, but also because making cilantro lime coleslaw is an easy way to get the kids to eat more vegetables. You can add julienne broccoli stems, which is a GREAT way to use those stems up if you tend to favor the florets. You can also add shaved Brussels sprouts too, like I did in the Costco-copycat Sweet Kale Salad. Or if the budget is tight and all you can swing is green cabbage, go for it! It’s hard to attribute the flavor of this cilantro lime coleslaw to just one ingredient, so you’re going to have to trust me when I say everything together makes this amazing. Kind of like Thai peanut sauce. Cilantro Leaves: there’s flavor in cilantro stems, so if you want to save the leaves for topping, definitely use the stems in the slaw! Greek Yogurt: Greek yogurt means you’re getting a bit of probiotics in your dinner (and you can make Greek yogurt too), which is always a win, but you can substitute sour cream or mayo (my failproof homemade mayo recipe) as well. Note – if you use mayo or even sour cream, you might want to up the lime juice or add a splash of apple cider vinegar for the extra tart. If you’re not a fan of tacos, we can still be friends. 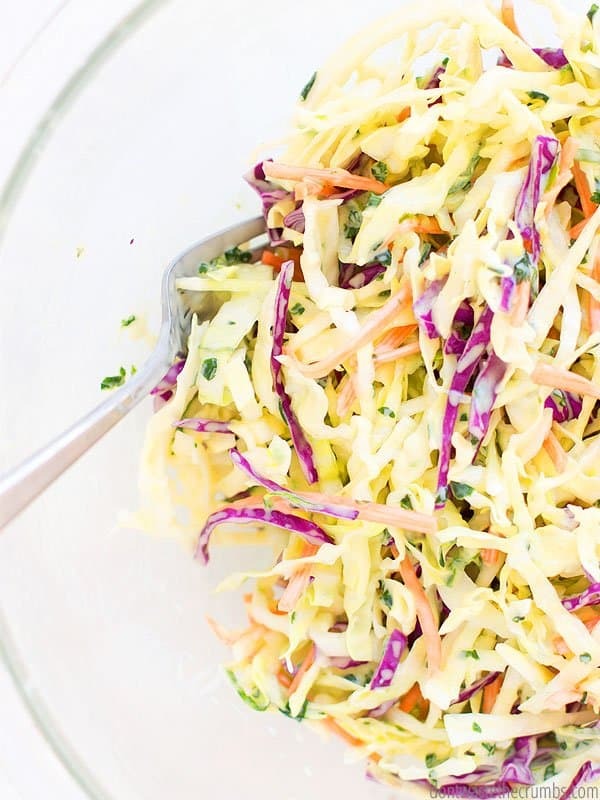 And there’s plenty of other ways to use cilantro lime coleslaw! 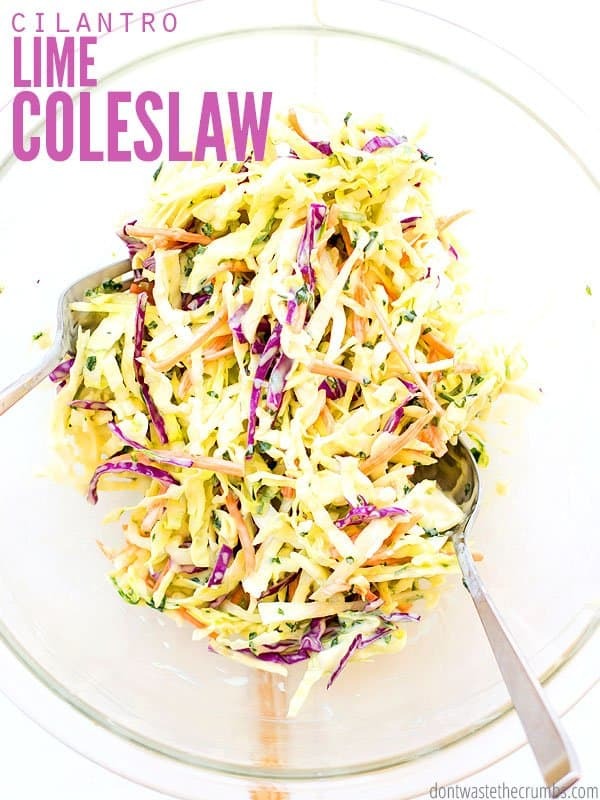 Got leftover coleslaw? This keeps really well for several days in the fridge. I usually add salt and pepper and serve it as a veggie side dish for whatever else we’re having this week (besides tacos!). 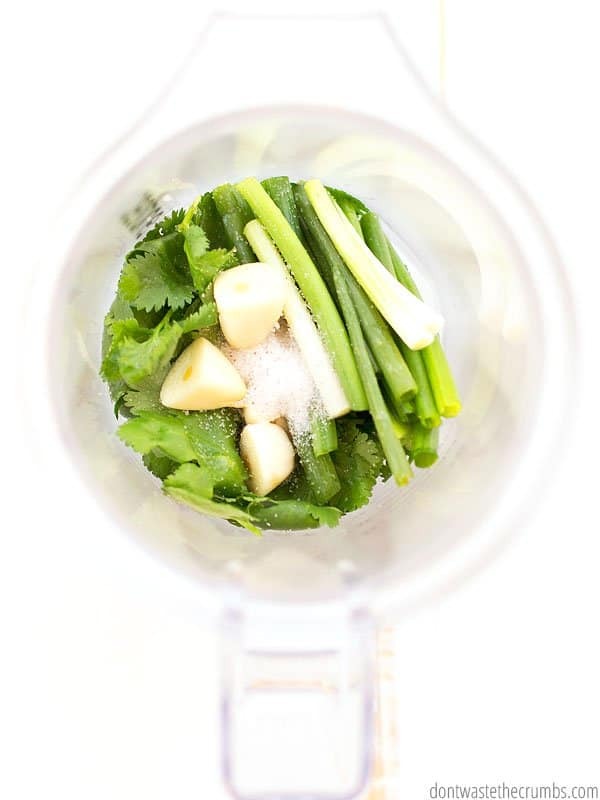 Combine all ingredients except the water and cabbage (and carrots, if using) in a blender. Pulse until the ingredients are combined, yet some green leaves are still visible. 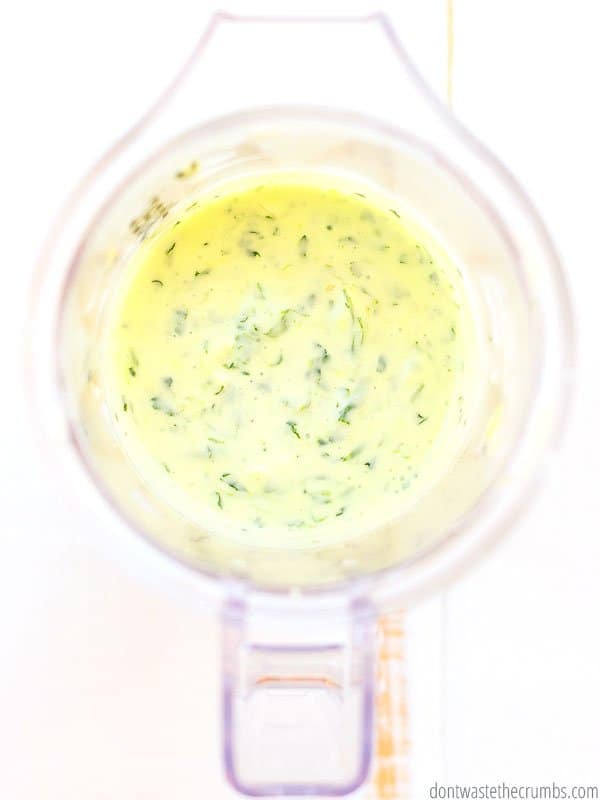 The consistency should be similar to salad dressing, so if you used Greek yogurt, sour cream or mayo, you might need to thin. Taste first, and thin using either water, apple cider vinegar or lime juice as desired starting with 1 tablespoon. Stir well after each addition and taste. When the sauce is ready, place the cabbage (and carrots, if using) in a very large bowl and add sauce. Stir well using two forks or a pair of tongs. 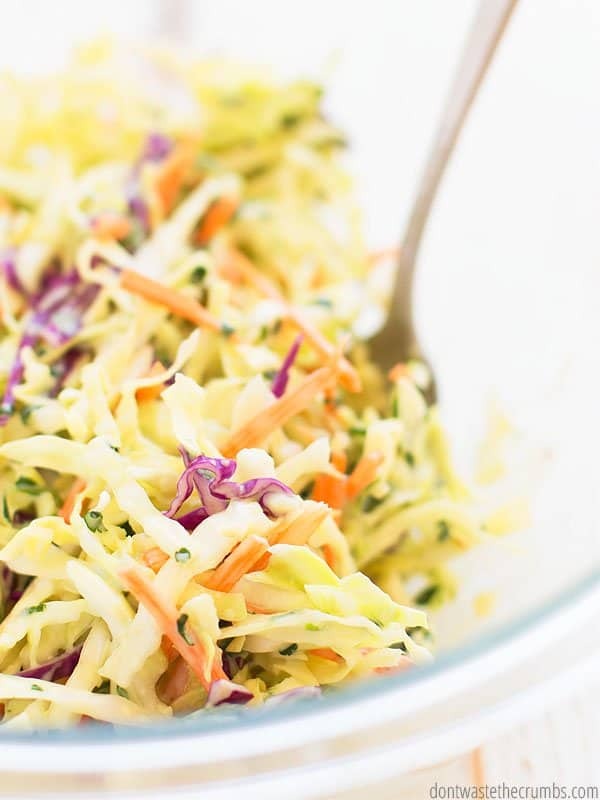 Let the coleslaw sit in the fridge for about 30 minutes for the flavors to develop. Serve cold. What type of toppings do you like on your tacos and sandwiches? Think you’ll give cilantro lime coleslaw a shot? Leave your ideas in the comments below! The magic and success of your recipes is in the ingredient list. Even if something tastes amazing, if it asks for 100 different ingredients, there’s no way I’ll make it. Imagine my surprise when this list is very long. Turn out, somehow the list repeated itself. So, it looks double the length it really is :-). Please feel free to delete my comment after! Just made our fourth batch of this. It is SO delicious! I made extra dressing to use on taco salad tomorrow. Winner recipe! WOW! Glad it’s a winner Erin! That’s such a great tip – Thanks for sharing Amanda! Tiffany, this was amazing! We made this tonight to go with slow cooker tacos. We made a few changes, the most notable of which is that I used half the oil, and it was still delicious. I also added a teaspoon of sugar, which I’m sure not everyone would want to do. It was delicious. We had more chicken taco meat and slaw than we could fit on our tiny corn tortillas, so we mixed the two together in a small dish to eat on the side. OMG! I’m going to try this recipe again, but use dill instead of cilantro and mix in some albacore to make a light and crunchy tuna salad. Thank you so much! Love this recipe! I’ve made it several times and always get compliments. I prefer to make the slaw a few hours ahead so the liquid can soften the cabbage a bit. I’m so glad you like it Teresa! I often make it ahead of time too, to meld flavors and to save time at dinner!